Virginia Republican Rep. Dave Brat told reporters in the Speaker’s Lobby just off the House floor Tuesday afternoon that he and other members of the House Freedom Caucus are meeting soon with members of the group of moderates known as the Tuesday Group about reviving the Ryancare bill. House Freedom Caucus members reached out to Rep. Charlie Dent (R-CA), the chairman of the Tuesday Group, who was involved in the negotiations between members of the House Freedom Caucus and House Republican leadership over Speaker Paul Ryan (R-WI)’s American Health Care Act. “We are still working on that,” Brat said. The speaker pulled the bill from the House floor just before it was going up for a vote after members of the Tuesday Group, usually the speaker’s allies, such as Dent, withdrew support from the bill. At a Tuesday morning press conference, Ryan said after meeting with the House Republican Conference, without staff in the room, that he was confidant his Ryancare bill could come back. Brat said that during the previous week’s negotiations the House Freedom Caucus made significant compromises, but its positions were repeatedly misrepresented. “We were never against pre-existing condition protection,” he said. Similarly, other House Republicans were convinced that the HFC was opposed to allowing children to stay on their parents’ health insurance until age 26 and allowing states to establish risk pools, when both had the support of the caucus. The main problem, Brat said, was that the House leadership handling the negotiation did not properly track and record changes in position and changes in the actual bill’s language. To correct this administrative flaw, Brat said the House Freedom Caucus is putting its own positions in writing. “This idea that we can’t get to yes on anything?” he asked the reporters. The former economics professor answered his own question when he told them that getting to yes should not be a problem for any House Republicans, because the House Republicans have voted 50 times to repeal Obamacare, one way or the other. A Capitol Hill source with intimate knowledge of the House Freedom Caucus’s negotiating posture and proposals told Breitbart News that while the HFC was accused of changing the goal posts, it was the House leadership that was difficult to nail down as to what was agreed to and what was not agreed to. The source told Breitbart News that it is important to remember that the House Freedom Caucus started at clean repeal, and no replace until after repeal. From there the HFC moved all the way to looking for modifications in the Essential Health Benefits and changes in the insurance mandates in the bill’s Title 1. Texas Republican Rep. Randy Weber told reporters just a few feet from Brat in the Speaker’s Lobby that the morning meeting with the speaker did not start out as a positive for him or his fellow members of the House Freedom Caucus. “There was a lot of angst and a lot of unhappiness, much of it was aimed at the Freedom Caucus,” he said. But the HFC members were there to show that they were part of the team, Weber said. The House Freedom Caucus is the conservative bloc inside the House GOP. Although it does not reveal its membership or its whip count, Breitbart News reporting learned that the HFC had north of 25 solid No-votes against the Ryancare bill. To pass the American Health Care Act, Ryan needed 216 votes, so with “no” votes coming from the 193 House Democrats, Ryan could not afford to lose more than 21 Republicans. The chairman of the House Freedom Caucus Rep. Mark Meadows (R-NC) told Breitbart News that he promised President Donald Trump he would negotiate in good faith with the House Republican leadership, but at different times in the negotiations, the leadership stopped talking to him. Meadows then reached out to the White House and hammered out the outline of a deal Wednesday night going into Thursday morning. It was at this stage that Ryan’s moderate allies abandoned the bill. Weber said the speaker told his members that many of them were not happy with the Ryancare bill. As the hour got closer to ten o’clock, members started heading back to the Capitol for hearings, but more than a few stayed behind to continue to hash it out with House conservatives, he said. For the congressmen who stayed behind, it was good to clear the air and for many members, it was the first time they had heard the actual position and reasoning of the HFC, he said. Weber said he believes based on the talks Tuesday morning and continuing among House Republicans, the leadership could bring up the bill soon and it would pass. Arizona Republican Rep. Trent Franks, another member of the HFC, said the extra time to work on the Ryancare bill will help it go through. 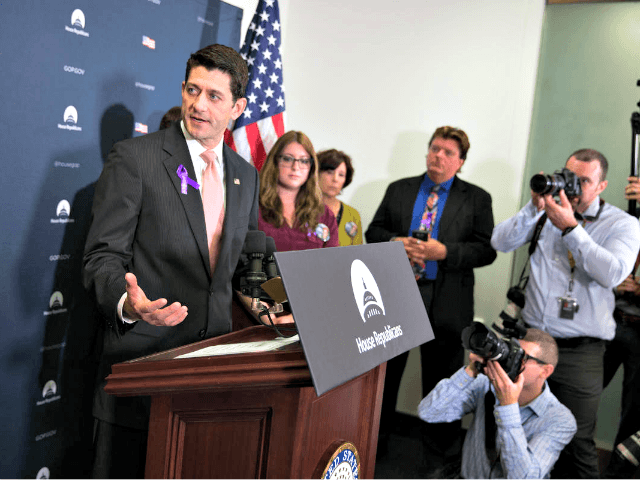 The bill was crafted privately by Ryan with working groups of congressional staffers, selected congressmen, and representatives from the insurance industry. The text of the bill was released without warning March 6 at 6:00 p.m., and had the bill passed 18 days later on Friday, the text would have remained virtually unchanged when it passed through the Ways and Means, Energy, and Commerce and Budget committees. The House leadership approved changes to the bill March 20, such as changing New York State’s handling of Medicare, adding a work requirement for Medicare, and eliminating Ryancare’s individual abortion tax credit. Franks said when the House Freedom Caucus demanded more substantive changes to the Ryancare bill, it was not looking to score advantages for its members’ districts. “We want what is best for the country going forward,” he said. Friday morning, before the bill was pulled, the House Freedom Caucus was still trying to find a way to get the bill so that its members could vote for it.